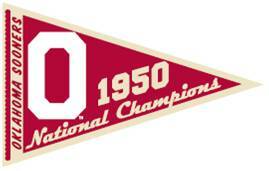 No matter the college colors you bleed, there's no denying the excellence of the University of Oklahoma's football program. 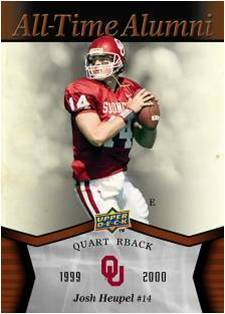 Adrian Peterson, Sam Bradford and Brian Bosworth are just a few of the standouts who played there. 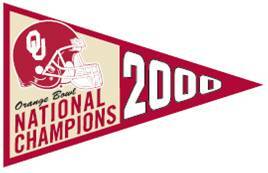 The seven National Championships speak for themselves. 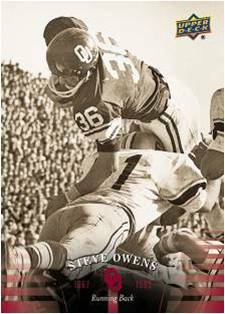 Upper Deck is honoring the Sooners football program with a standalone set that covers seven decades of the school's pigskin history. 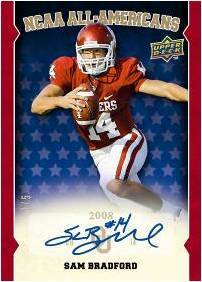 2011 Upper Deck University of Oklahoma Football carries a 100-card base set and promises one autograph per hobby box. 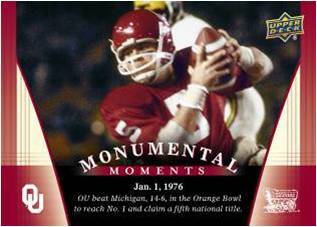 100 card base set (80 regular cards, 20 Monumental Moments). 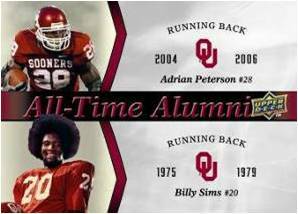 Set includes such Sooners legends as Adrian Peterson, Sam Bradford, Brian Bosworth, Billy Sims, Barry Switzer and Lee Roy Selmon. 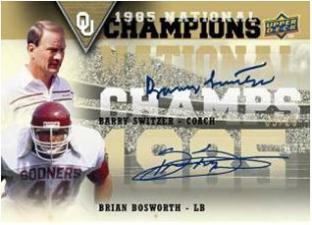 Base set parallels: Gold, Autographs (1:30). 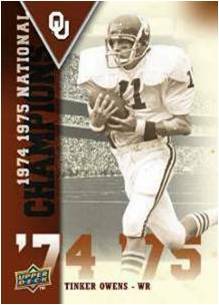 Autograph inserts: All-Time Alumni, All-Time Alumni Duos, All-Time Alumni Duos, NCAA All-Americans, National Champions, National Champions Duos, National Champions Trios. 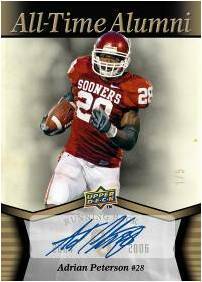 Dual autographs are numbered to 20 or less while triple autographs are numbered to 3. 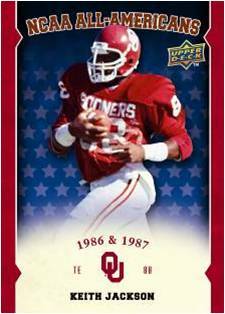 OU Icons (30 cards, 1:12) use Special Light F/X technology. 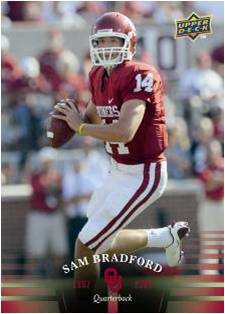 The university's greatest are highlighted with All-Time Alumni inserts. The set also includes All-Time Alumni Duos and All-Time Alumni Trios. 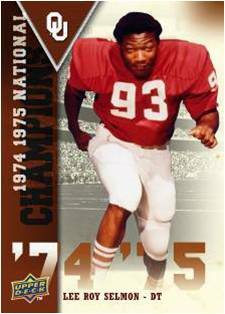 Championship standouts are the focus for the National Champions insert set. The cards are also available in National Champions Duos and National Champions Trios. NCAA All-Americans celebrate individual all-star seasons. Ten-pack blaster boxes include one of seven exclusive replica Championship Pennants. 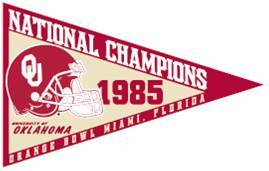 I am a 70-year old OU fan through the ages and a memorabilia collector. I really like this concept. I agree. 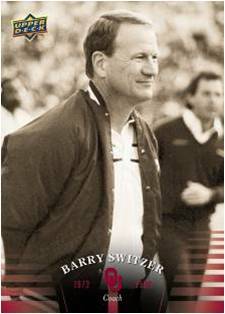 It sounds like a product that certainly fills a niche market but there’s also enough for non-Sooners faithful to grasp onto. This is a great idea. I’d like UD to release some other sets like this. Michigan and Florida would be at the top of my list.